When I bought this car it had already been converted to electric drive. The story I was told is it was done by a fellow in Richmond CA who likes to restore old VW&apos;s. For this car he decided to "do something different" and make it an electric car. 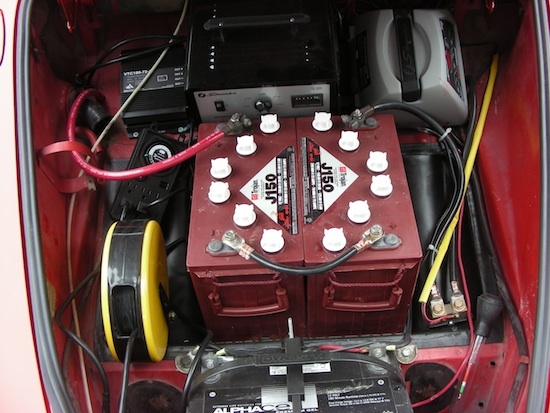 He chose a Wilderness Energy conversion kit, resulting in a car with a small 6.7" motor, and a 72 volt flooded lead acid battery pack (150 amp-hour Trojan&apos;s). Set up this way the car barely got 50 miles/hr top speed, and barely had a 10 mile range. I drove it that way for a few months, but it was unsatisfactory and I wanted to upgrade it. The upgrade is what&apos;s shown on the front page. What we see here is the original setup. This is the front trunk. In the middle are two of the boat anchors (er... batteries). To the left is a reel holding an extension cord that was used for charging. 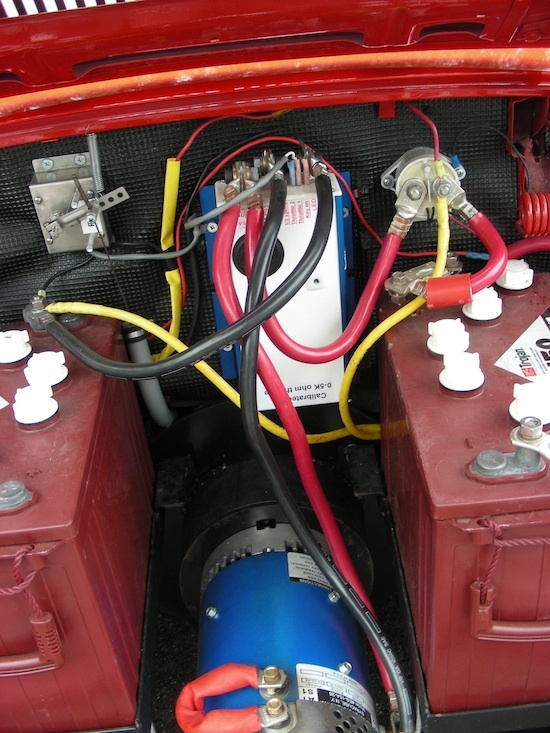 Behind the batteries are the two chargers, one for the 72 volt system, the other for the 12 volt accessory battery. Another view of the front trunk. 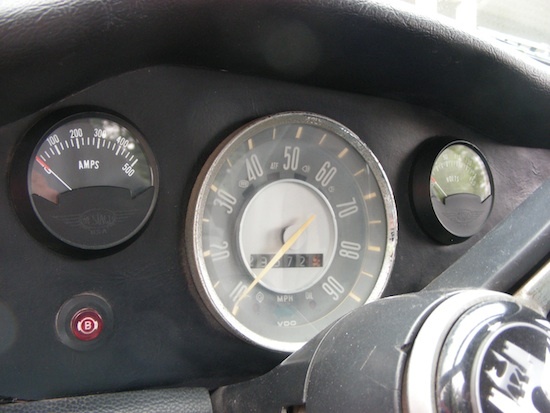 The instruments were simple analong volt/amp gauges. This is the engine compartment. 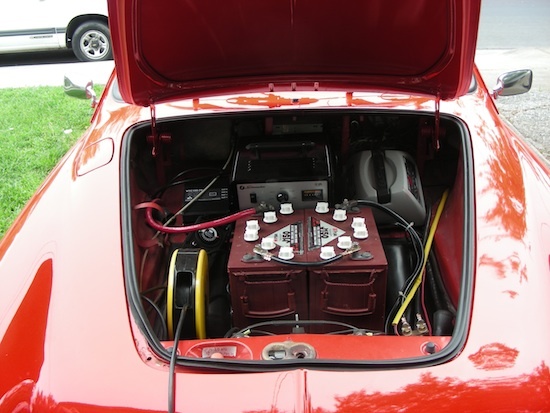 The motor was a D&D ES-15 that&apos;s woefully underpowered to drive a car. 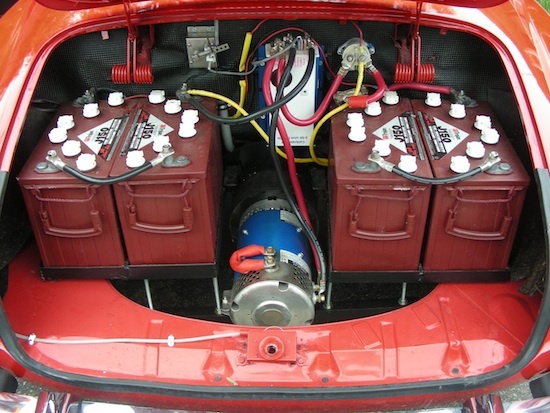 The other four batteries are visible. The controller is in the middle, with the POT Box to the left, and the contactor/solenoid to the right. It&apos;s a very simple system. A close-up of the center portion giving a few details of component layout. The firewall had been covered in this black plastic.